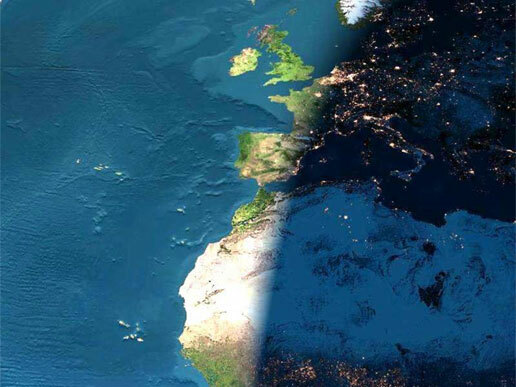 This image presents a remarkable view of the North Atlantic Ocean, stretching from the equator and western Africa northward to Iceland and Greenland, with sunset occurring over Scandinavia, France, Spain, Algeria, Mali, and the Ivory Coast. This is not a real photograph, as such a photograph would be impossible to obtain. The image is a composite obtained from different elements. A variety of scientific instruments were used to obtain images using different wavelengths of light and also sound. The images were obtained at different moments in time and space. Next, a computer was used to combine all the images and the result can be seen above. An unreal visual image of our planet! Scientists routinely use images like this (called visualizations) to interpret complex data, and communicate their understanding to others. If you are interested in learning more about how this image was made visit this page: http://earthobservatory.nasa.gov/Features/LivingEarth/.